Explanation: Is there any place in the world you could see a real sight like this? Yes. Pictured above is single exposure image spectacular near, far, and in between. Diving into the Earth far in the distance is part of the central band of our Milky Way Galaxy, taken with a long duration exposure. Much closer, the planet Jupiter is visible as the bright point just to band's left. Closer still are picturesque buttes and mesas of the Canyonlands National Park in Utah, USA, lit by a crescent moon. 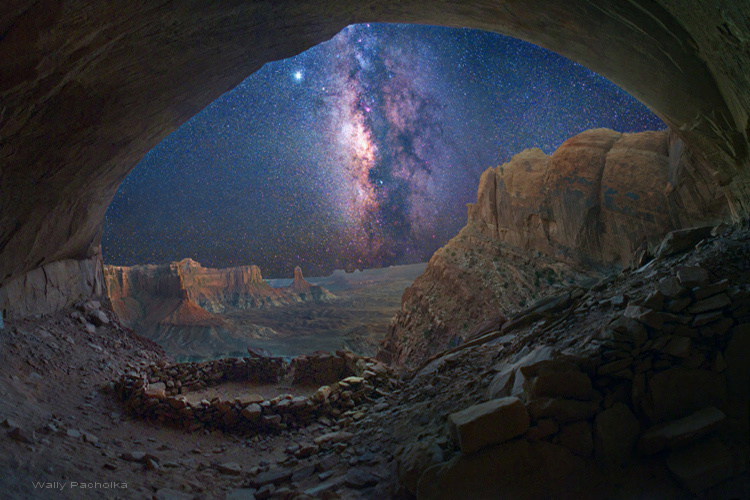 In the foreground is a cave housing a stone circle of unknown origin named False Kiva. The cave was briefly lit by flashlight during the long exposure. Astrophotographer Wally Pacholka reports that getting to the cave to take this image was no easy trek. Also, mountain lions were a concern while waiting alone in the dark for just the right exposure. Without reading the background, there is no way I would have believed that was a single exposure!